A popular religious destination, Gurudwara Bangla Sahib is the most prominent Sikh gurdwara (house of worship), in Delhi. Dedicated to the eighth Sikh Guru, Sri Harkishen Sahib, it is situated near Connaught Place Market. Throughout the day one can hear the soothing Gurbani (devotional music) echoes in the Banglasahib Gurduwara. Gurdwara Bangla Sahib was originally a bungalow belonging to Mirza Raja Jai Singh, hence the name Bangla Sahib. It was known as Jaisinghpura Palace. Mirza Raja Jai Singh was a senior general of the Mughal emperor Aurangzeb and a ruler of the kingdom of Amber. The eighth Sikh Guru, Guru Har Krishan resided here as a guest of Raja Jai Singh during his stay in Delhi in 1664. During that time, there was a smallpox and cholera epidemic. It was Guru Har Krishan who helped the suffering by giving aid and fresh water from the well which had a miraculous healing effect on their mind, body and soul. A small tank was later constructed by Raja Jai Singh inside its complex known as the 'Sarovar' to his memory and since his death, it has been the place of worship of the Sikh. The Gurdwara complex houses the temple, a large pond, a higher school, Baba Baghel Singh Museum, a library, a hospital and a community kitchen hall known as the 'Langar'. As with all Sikh Gurdwaras, the concept of langar is practiced and everyday, free food is provided to all the devotees that come to the Gurdwara and all people may eat in the langar hall. The food is prepared by gursikhs who work there and also by volunteers. At the Gurdwara, all visitors should remove their shoes and cover their heads before entering the main hall. Guides, head scarves, and shoe-minding service can be found inside the compound and are available free of charge. Anybody can volunteer to help like keeping the shoes in the shoe-minding room and cleaning the precincts of the Gurudwara. The Gurdwara complex also houses a higher secondary Khalsa Girls School, Baba Baghel Singh Museum, a library houses texts on Sikh religion and history and a hospital runs by the Delhi Sikh Gurudwara Management Committee. One of the most famous and popular features of the Gurdwara is the pond inside its complex, known as the "Sarovar". The water from this Sarovar is considered holy and is commonly known as 'Amrit' and people carry the water to their home, in order to cure their ailments. Gurdwara Bangla Sahib has a simple and large main hall covered by a stunning small golden dome with a sculpted bronze cupola. Air conditioning has been done inside the Gurudwara and also in the Langar Hall. 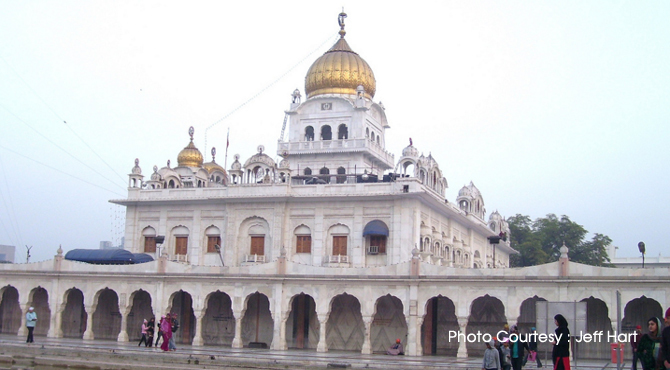 The Baba Baghel Singh Museum is located in the basement of the Gurdwara which is also very popular with visitors. It is named after the Sikh General Sardar Bhagel Singh who supervised the construction of nine Sikh Shrines in Delhi in 1783. The museum houses the paintings depicting historical events connected with Sikh history, old manuscripts of Sukhmani Sahib and Japji Sahib, handwritten Mool Mantar by Guru Arjan Dev ji, a miniature bir of Guru Granth Sahib, colorful canvases of Sikh gurus, coins etc. The major celebrations in the Gurdwara is the birth anniversary of Guru Sri Harkrishan Sahib and death anniversary of Maharaja Ranjit Singh Ji. The complex also houses a Yatri Niwas, a multi-level parking space with a capacity of 1,000 cars and a toilet complex. From the backside of the Gurudwara, one can get a better view from the roadside. Timings:2.30 pm-9.30 pm; Open on all days; Admission Fee: Free and open to all.